Although not widely celebrated in Australia, but in the spirit of Halloween, my Sunday Stash is a sampling of orange and black fabrics. I hope you have enjoyed your Halloween celebrations! More happy Sunday Stashers can be found here. I love your orange stash, nice to come for a visit and oogle over your quilts! These are stunning and perfect for Halloween! Definitely in the spirit! Trick or treaters are arriving right now! Oooh, those are stunning. I particularly like the Denyse Schmidt - it reminds me of medieval tiles. I'm really loving orange! The Heather Ross Far Far Away line is gorgeous. Weird - it's still Saturday here!!!! Love the black. I love the orange and black for Halloween! Great Halloween stash! Love the fabrics. Lovely fabrics, great colours - did you get any trick or treaters? 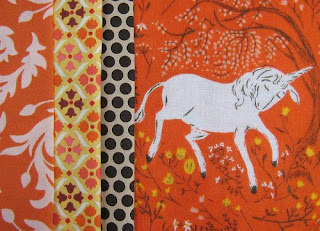 I'm slowly coming around to orange :) & I love the huge range of colours you use in your quilts. Thanks so much for your welcome message on my blog, you and the other 'modern' quilters online are such an inspiration!